William George Jacobs was born in New Headington in 1894, the son of Charles William Jacobs (born in Headington in 1867) and Frances Selina Young (born in Headington in 1863 and baptised at St Andrew's Church on 11 October). Herbert Reginald Jacobs (born at 4 Windsor Street on 11 April 1900 and baptised at St Andrew’s Church on 1 July). At the time of the 1901 census William (6) was living at the present 13 Windsor Street (then numbered 4 Windsor Terrace), with his father Charles (33), who was a house painter, his mother Frances (37) and his brothers Kenneth (3), and Herbert (eleven months). New Headington was taken into the new parish of All Saints' Church, Highfield in 1910. At the time of the 1911 census William (16) was an inmate at the Northampton Society Reformatory for Boys in Towcester, with his occupation given as “labourer”. His father Charles (43), who was still a house painter, and his mother Frances (47) were now living at the present 62 Lime Walk with his brothers Kenneth (13) and Herbert (10), who were still at school. In the First World War William George Jacobs initially served in the Oxfordshire & Buckinghamshire Light Infantry (Service No. 9996), and then as a Sapper in the Royal Engineers (Service No. 311313). He was wounded in mid-1916 and again in 1918. He was brought back alive to England, probably soon after the Armistice, but died at the military hospital in Stockport on 30 December 1918 at the age of 24. 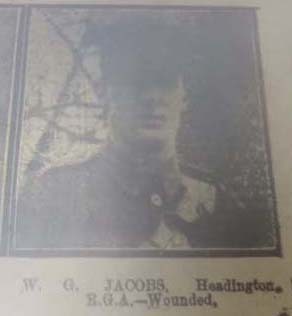 His family must have arranged for his body to be brought back to Headington from Stockport, and he was buried on 4 January 1919 at Headington Cemetery (5. B. 10). 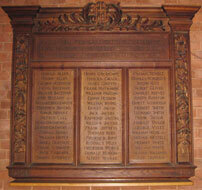 William Jacobs is remembered on the Roll of Honour of All Saints’ Church, Highfield. Charles Jacobs died at the age of 75 (still described as a painter) at the present 96 Lime Walk (then numbered 82). He was buried at Headington Cemetery on 26 February 1943 (Grave L.74). 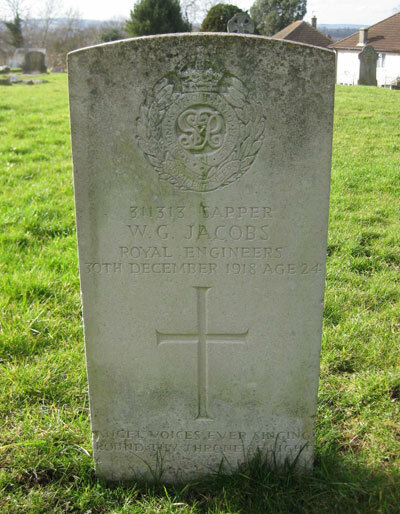 Frances Selina Jacobs died at 96 Lime Walk at the age of 86 on 20 December 1949 and was buried with her husband in Headington Cemetery on 23 December. Her effects came to £260 0s. 3d., and her executor was her son Kenneth Francis Jacobs, who was now a factory policeman.